Waterside is the first development in Sarasota tagged as part of the master-development of Lakewood Ranch. First conceptualized as the Villages of Lakewood Ranch South, this community is set on about 3,500 acres easily accessible via University of Parkway through Lorraine Road from the north. Its site spreads just off south of the Lake Club and Sarasota Polo Club, and provides a perfect template for newly built Sarasota homes for sale. 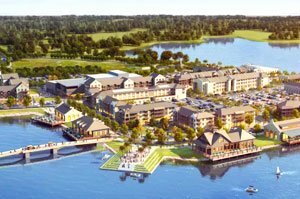 The developer of Lakewood Ranch, Schroeder Manatee Ranch (SMR), broke ground at Waterside in 2016 and set it for 12 neighborhoods with a total of over 5,000 residential units. Community life in this development is woven around a tapestry of seven lakes and a town center called Waterside Place. 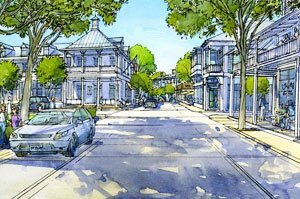 Envisioned as the community’s downtown, this town center is platted on the northern shore of the Kingfisher Lake, the largest in the property at 250 acres. An eight-acre peninsula reserved for the property’s Waterside Park, is likewise within this mile-long lake. At Waterside Place, the community’s residents can enjoy superb shopping and dining experience plus a lot more, cultural activities included. The Players Centre for Performing Arts, the oldest performing arts organization in Sarasota, is notably moving its campus from the downtown to this Town Center and bringing in some 400 theatre shows a year. Besides providing space for outdoor public gatherings, the nearby Waterside Park is designed to accommodate a boat dock, a dog park and waterfront restaurants as well as a farmers market. Sarasota homes for sale have been launched in two Waterside neighborhoods—Shoreview and LakeHouse Cove. Pulte Homes, the builder in Shoreview has set it for 246 residences. 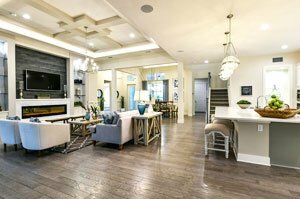 It offers in this neighborhood nine designs, with choices on one- and two-story builds featuring floor plans ranging from 2,488 square feet up to over 4,500 square feet. Pricings starts from the $500s and tops at over $1 million at Shoreview which is platted adjacent east of the town center, Waterside Place. There are three builders involved in home construction at LakeHouse Cove—Arthur Rutenberg, Lee Wetherington and Homes by Towne. All three presented their respective Waterside models in the 2018 Manatee Sarasota Parade of Homes wherein Pulte Homes also participated with its own entry at Shoreview. Wedged east and south of Shoreview, LakeHouse Cove is sited just off west of Lorraine Road and has been platted for 391 home lots set around a lake. Arthur Rutenberg offers at LakeHouse Cove nine models ranging in size from about 2,700 square feet up to 4,320 square feet. Designed with three to four bedrooms, these residences are priced from the $900s up to over $1 million. Lee Wetherington, on the other hand, has six models set for this neighborhood. These are priced from the $500s and are designed with floor plans of between 3,800 and 5,650 square feet featuring three bedrooms. Homes by Towne, for its part, offers choices from its Catamaran and Clipper home series having floor areas of between 1,800 and 3,430 square feet with their prices starting from the $400s. Additional come-ons at LakeHouse Cove include a state-of-the-art community center, fitness facilities and resort-style pool. Also potential magnets to buyers are a playground, kayak launch, dog parks, and sports courts. Below are the current real estate listings available at Waterside at Lakewood Ranch.